The Grams Performance 70mm Drive-By-Wire (DBW) Throttle Body for MKIV VW is the perfect upgrade for the restrictive factory unit! The Grams throttle body is a Plug-n-Play direct OEM replacement that does NOT require swapping electric motors, wiring or mounting adapters. These units are not re-manufactured. Each throttle body includes all new components including a CNC machined billet 6061-T6 aluminum housing with a precision-honed oversized bore, a responsive high-torque servo motor, and a proprietary Non-Contact Hall Effect TPS sensor. To ensure the best performance, throttle response and drive-ability, each TPS sensor is calibrated to meet the specific requirements of the vehicles engine management system. The Grams electronic throttle body is the perfect upgrade for both modified and stock engines with increased airflow demands. The new Grams Drive-By-Wire Electronic Throttle Body for VW/Audi MKV/VI 70 mm is the perfect upgrade for the restrictive and trouble-prone factory 57 mm VW/Audi throttle body. 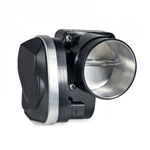 The Grams throttle body is a Plug-n-Play direct OEM replacement that doesn�t require wiring or mounting adapters. These units are not remanufactured. Each throttle body includes all new components including a CNC machined billet 6061-T6 aluminum housing with a precision-honed oversized bore, a high-torque servo motor, and a proprietary Non-Contact Hall Effect TPS sensor. To ensure the best performance, throttle response and driveability, each TPS sensor is calibrated to meet the specific requirements of the vehicles engine management system. 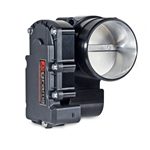 The Grams electronic throttle body is the perfect upgrade for both modified and stock engines with increased airflow and reliability demands.